Start by signing into your code.org account or go down the page to visit other coding sites. Our grades 1-5 students will partcipate in "The Hour of Code" during Computer Science Education Week, in December 2017. The Hour of Code is a global movement reaching tens of millions of students in 180+ countries. It's a one-hour activity where students of all ages can choose from a variety of self-guided tutorials, from kindergarten on up. It is meant to be a spark to keep students learning computer science. Once students see what they create right before their eyes, they're empowered to keep learning. Below, are the links used during this week and beyond. BBC Schools Primary Computing - Computing resources for primary school children and teachers. Find games, videos and audio clips by level and topic. Code.org - Learn the basic concepts of Computer Science with drag and drop programming. This is a game-like, self-directed tutorial starring video lectures by Bill Gates, Mark Zuckerberg, Angry Birds and Plants vs. Zombies. Learn repeat-loops, conditionals, and basic algorithms. Computer Science Education Week - Computer Science Education Week (CSEdWeek) is an annual program dedicated to inspiring K-12 students to take interest in computer science. Blockly - Blockly is a web-based, graphical programming editor. Users can drag blocks together to build an application. No typing required. Made with Code - Google is looking to inspire girls to pursue their dreams with code. Khan Academy's One Hour of Code - Khan Academy is an organization on a mission. We're a not-for-profit with the goal of changing education for the better by providing a free world-class education for anyone anywhere. 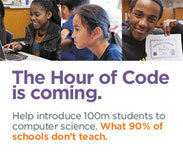 Microsoft - In partnership with Code.org, Microsoft is challenging 10 million youth to participate in the Hour of Code. That means just one hour of learning the basics of computer science. It's easy, fun and you can do it for free with one of their free tools. Scratch from M.I.T. - Scratch is a free programming language and online community where you can create your own interactive stories, games, and animations. stories and animations via puzzles, interactive tutorials and progressive challenges.